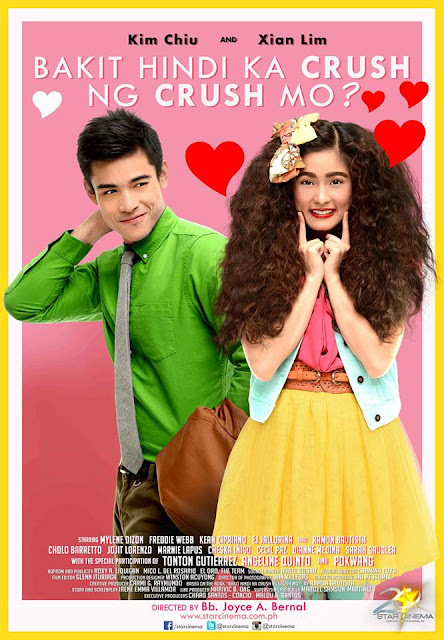 The bestselling book by comedian and author Ramon Bautista, Bakit Hindi Ka Crush ng Crush Mo gets a film adaptation featuring Kim Chiu and Xian Lim in the leading roles. The movie directed by Bb. Joyce Bernal will make its way into cinemas nationwide on July 31, 2013. The two young actors have previously worked together in two big teleseryes on the Kapamilya channel namely My Binondo Girl and Ina Kapatid Anak. Will their small screen chemistry translate into the big screen? Find out at the end of this month when Star Cinema releases the film nationwide. Also starring in the movie are Mylene Dizon, Freddie Webb, Kean Cipriano, EJ Jallorina, Ramon Bautista, Cholo Barretto, Jojit Lorenzo, Marnie Lapus, Cheska Inigo, Cecil Paz, Dianne Medina, and Sarah Gaugler with special participation by Tonton Gutierrez, Angeline Quinto and comedienne Pokwang.